One of my unofficial resolutions this year is to cook more. 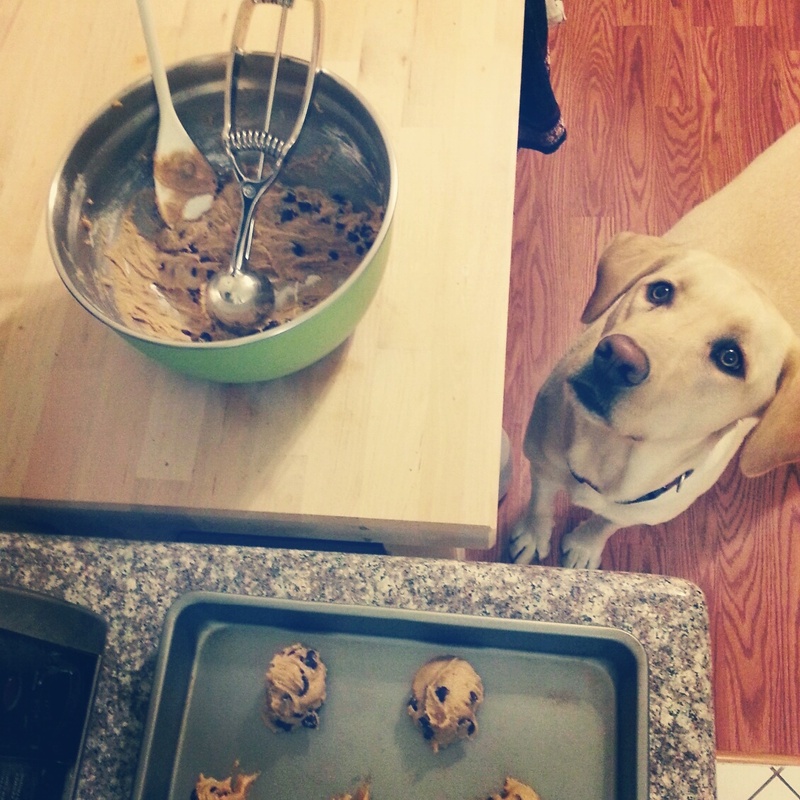 If you’ve followed my blog, you know how much of a baker I am (mostly of chocolate chip cookies…weekly). Cooking was something I was never taught growing up, and since it doesn’t always lend itself to exact measurements and an easy step by step process, like most baking recipes, I’ve mostly tried to stay away from it. Since now I have some extra time to devote to it, and since my husband works long days, I decided I should actively try my hand at cooking dinners. I’ve been cooking at least one new recipe a week, and with just the two of us, this lasts us 2 or 3 days with the leftovers. To my delight, I’ve actually become a lot better at it. I don’t stress about following the recipe to every minute detail, and I’m not even measuring everything (*gasp*)! I’m trying new recipes we haven’t made before, and it’s actually become an enjoyable pastime for me. I’ll put some Regina Spektor Pandora on, pour a glass of wine, and get cooking. It’s (usually) relaxing and therapeutic, and at the end of it, we have a warm, home cooked meal to enjoy together. Whitney has cooked us countless dinners in our relationship (I always made the desserts), so I’m also happy to be giving back to him as well (let me note that he is not making me cook him dinner…this is something I want to do ;p). Talking about food, I caught part of a documentary, Vegucated, which follows three meat and cheese loving people as they adopt a vegan diet for six weeks. It addresses the health and environmental benefits of a vegan diet, as well as the animal cruelty that is apart of the meat industry. Now, I’m not going to get on a soap box or lecture people about eating meat, but the documentary really struck me. Since I’ve been cooking and working with raw meat, I’ll often get grossed out with what I’m squishing and tearing in my hands. But besides seeing the layers of fat and knowing of the growth hormones and whatever else they inject into these animals (and how hurtful this industry is to our environment), the thing that affects me the most is how brutally the animals are treated and how this is allowed because it’s “common practice”. I don’t want to get too into this issue on my blog, but I would encourage watching these documentaries, so at least you are aware. Anyway, this past week and a half I have eaten no meat. I don’t know how long I’ll keep this up, or if I’ll eat meat every now and then, but it’s something I want to try for myself. And hey, it doesn’t hurt to eat more vegetables, right? Here are some photos of food I have been making or eating lately. We are trying to make eating healthy and being active apart of our lifestyle, but that doesn’t mean we don’t enjoy special treats. The earlier of these recipes have meat in them; the latter don’t. I honestly don’t think I have ever purchased Girl Scout cookies in my life (but of course I have eaten them!). 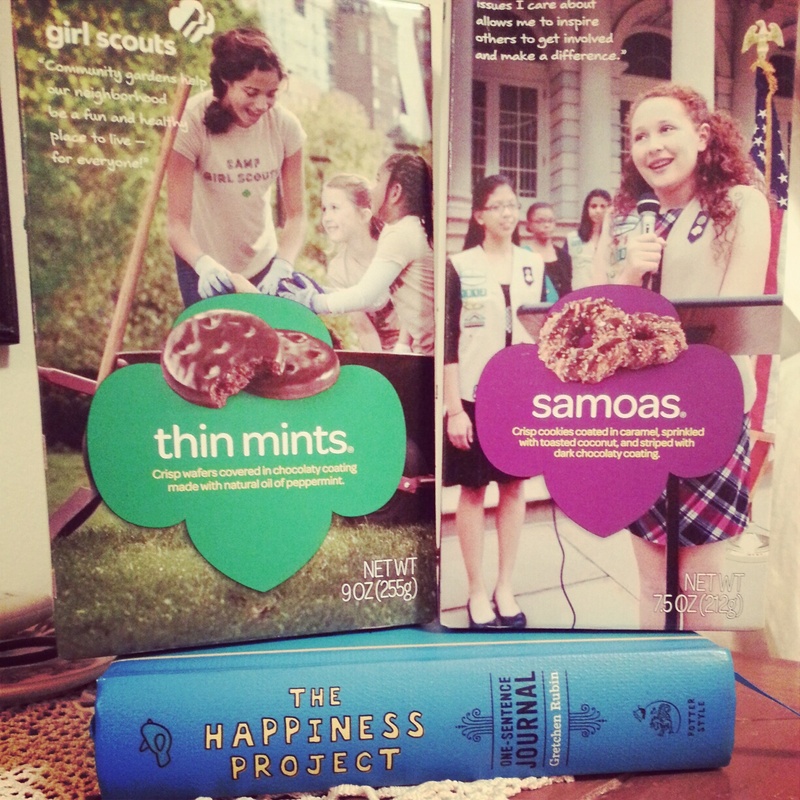 We finally tracked some Girl Scouts down at the grocery store and purchased a few boxes. I had completely forgotten that the scrapbook my sister put together for my bachelorette party included recipes from all of my girl friends! 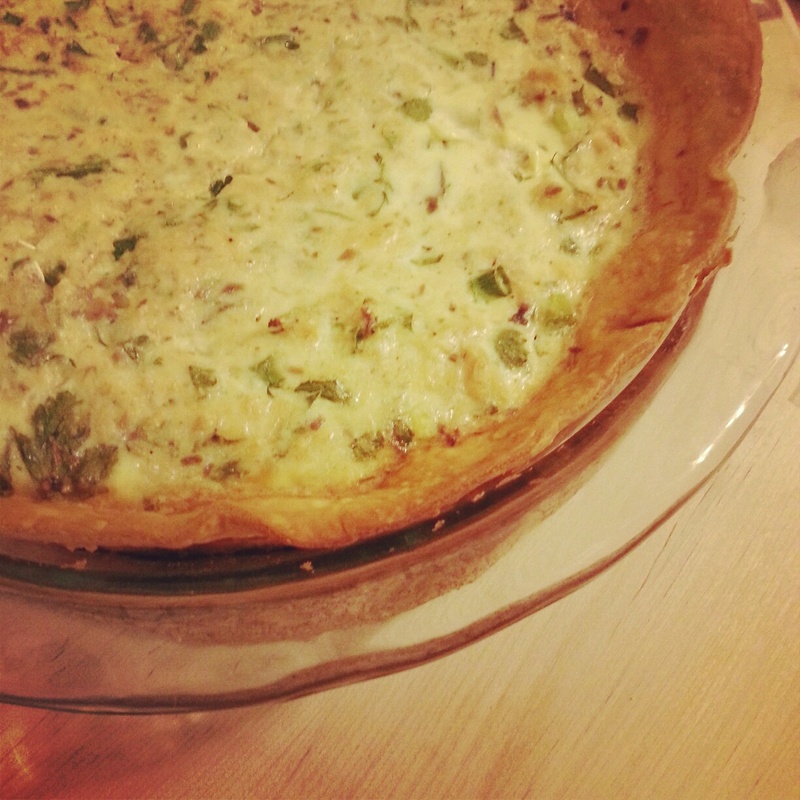 This salmon quiche recipe is from my friend, Jessie. It’s really easy and delicious (though I’m having a bit of trouble with the mixture seeping through the crust). I tried it again later in the week with all veggies and had the same problem. This is a recipe I’ll have to return to because it tastes so good. 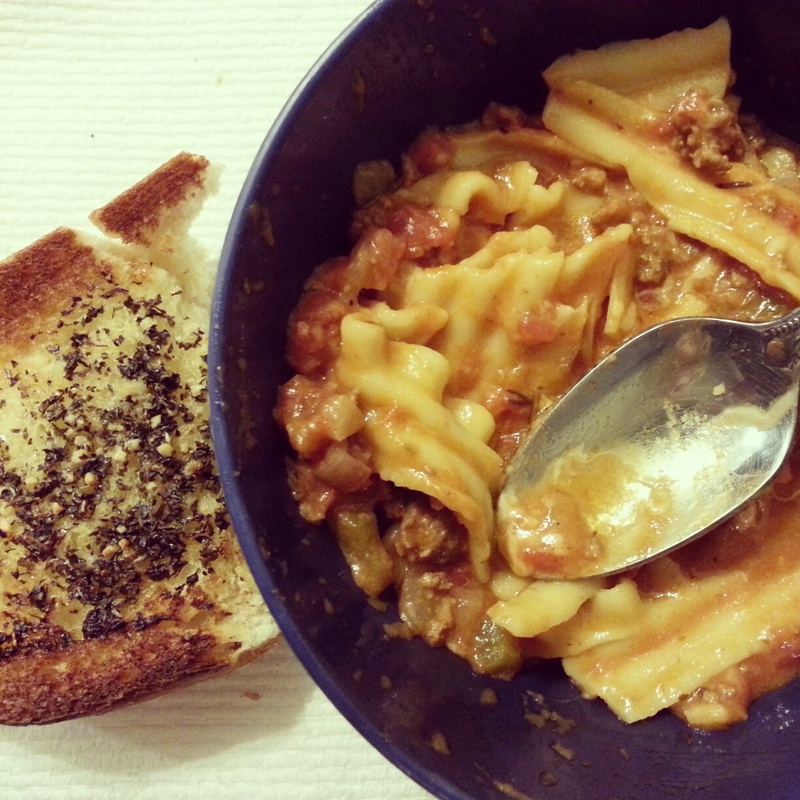 “Tastes like Lasagna” Soup, a recipe in my scrapbook from Lindsy. Another easy recipe that really tastes like lasagna! She also included the easiest recipe for garlic bread that is SO GOOD. I could eat garlic bread all day every day. Whitney grilling us breakfast one Saturday morning, and Kip trying to get in on the action. 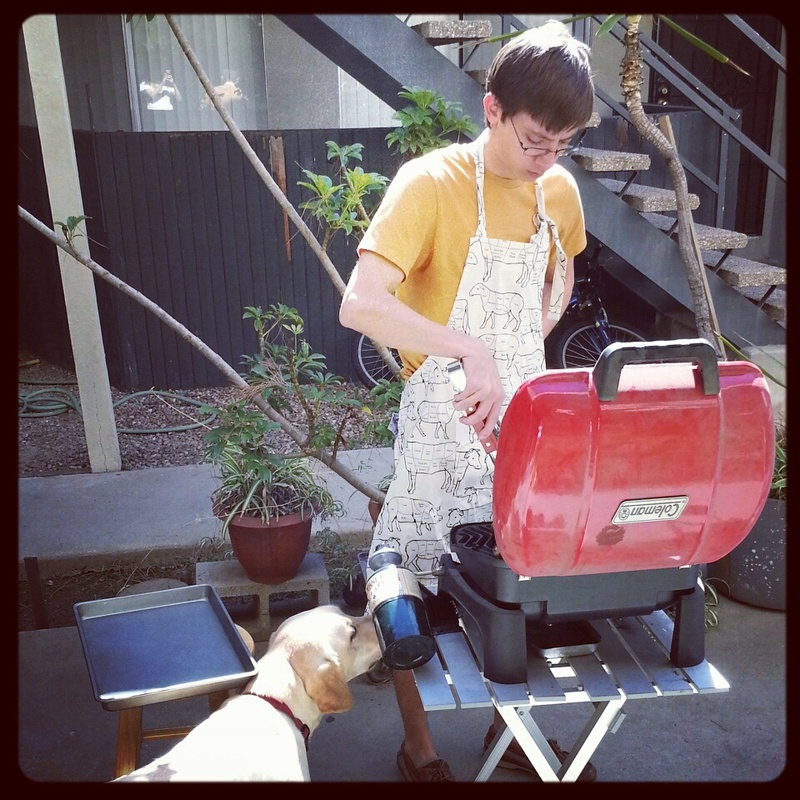 I understand the irony of him wearing a cuts of meat apron, a gift from his cousin. 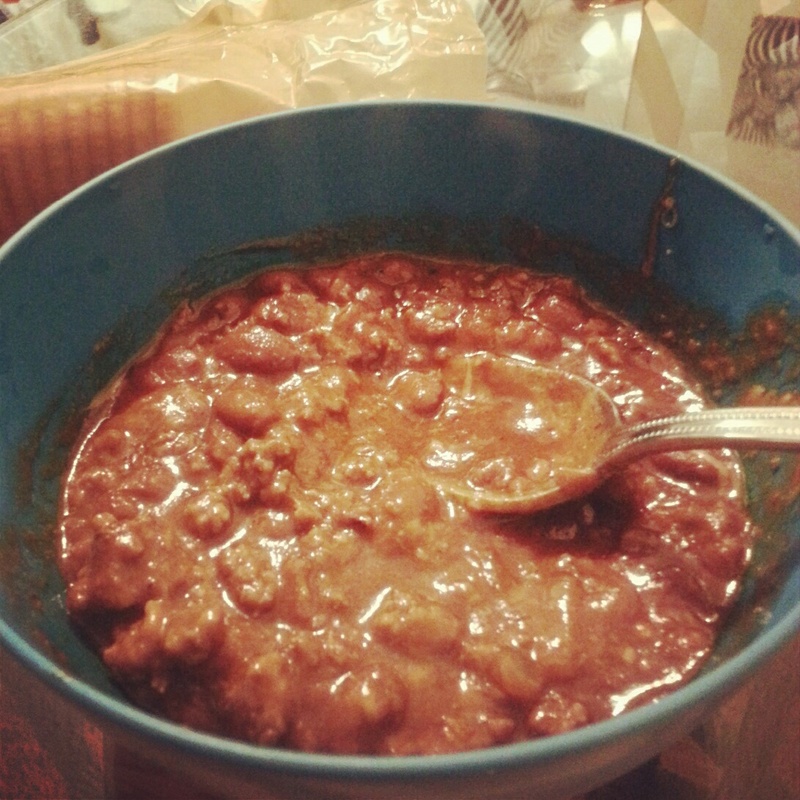 “Clyde’s Famous Chili”…a recipe my mom gave me. I made it a couple of years ago with the wrong beans, and I thought I would finally try it again. It’s really easy (do you see a pattern here? ), delicious, and provides a lot of leftovers. I may have to attempt this recipe with all beans and no meat and see how it goes. 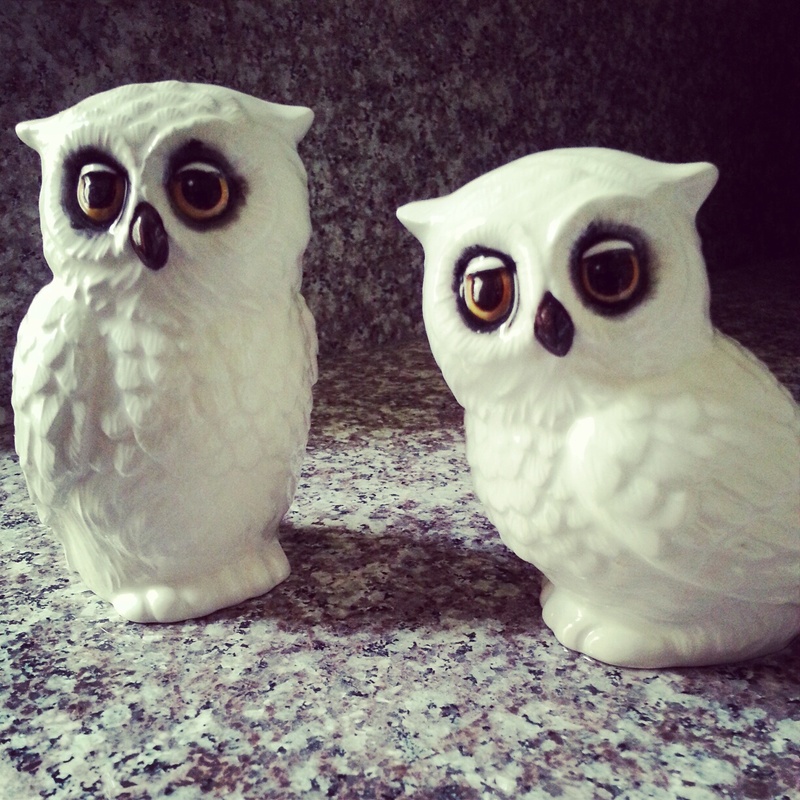 Um, I’m a little bit obsessed with our new salt and pepper shakers. Would you guess that they are from Macy’s?! We had some gift card money leftover from our wedding, and I was so glad to have found these online (super affordable too). 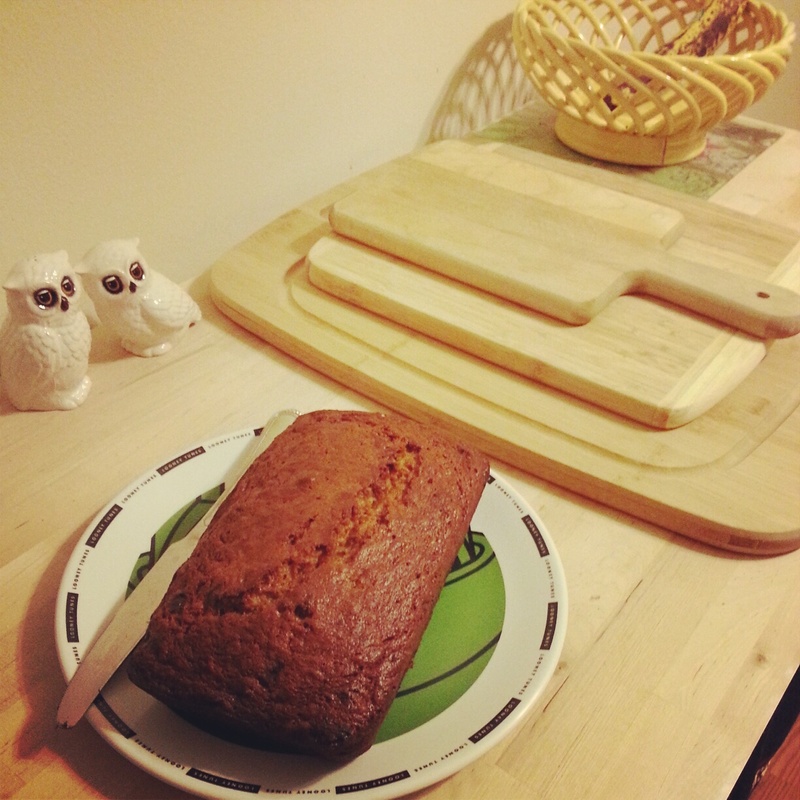 If you know me, you probably also know that (though not as often as chocolate chip cookies), I bake banana bread. A lot. We seem to never get through a whole bunch of bananas before they get too ripe, so I choose to put them in bread instead of throw them away. This was the best banana bread I have ever made for some reason. Banana bread is great for breakfast or a yummy snack. 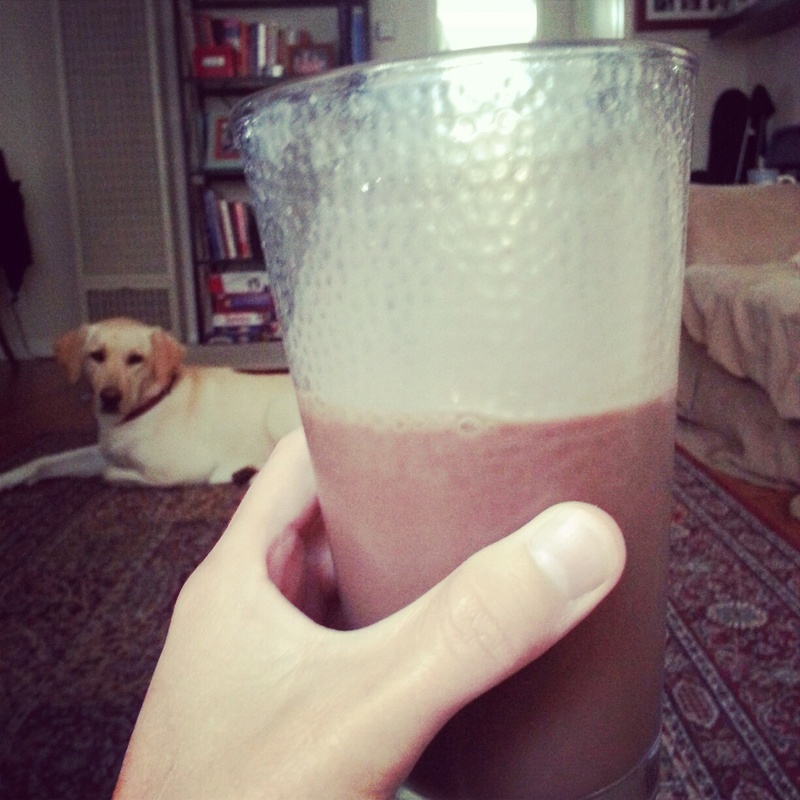 Dark chocolate almond milk, suggested by my sister. 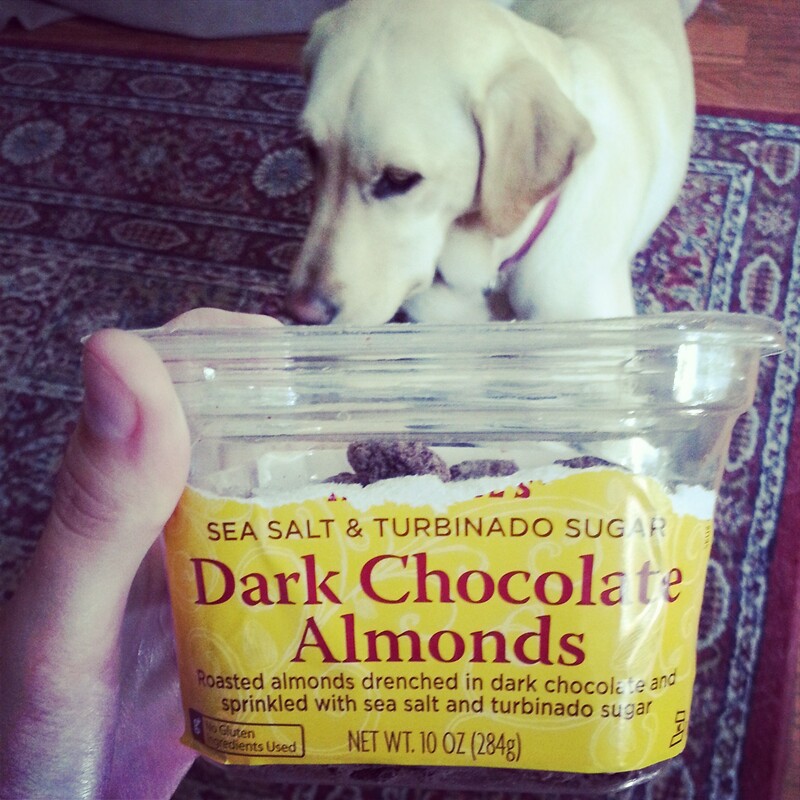 I originally tried the Silk brand, but I like Trader Joe’s chocolate almond milk a lot better. A great alternative to milk if you have issues with dairy. And guys, it’s CHOCOLATE. Chocolate chip cookies, but I only bake half a batch, so that’s better…right?! Whitney cooked this (all vegetable!) meal. Brussels sprouts, asparagus, green beans, and edamame cooked in some oil and butter with garlic. This week I also cooked a yummy penne pasta (from The Pioneer Woman) that I’ve made before (minus the shrimp). Healthy lunch! My uncle works on the business side for an avocado farm, and he gave us a whole bunch of delicious avocados (we’re kind of on an avocado kick right now). 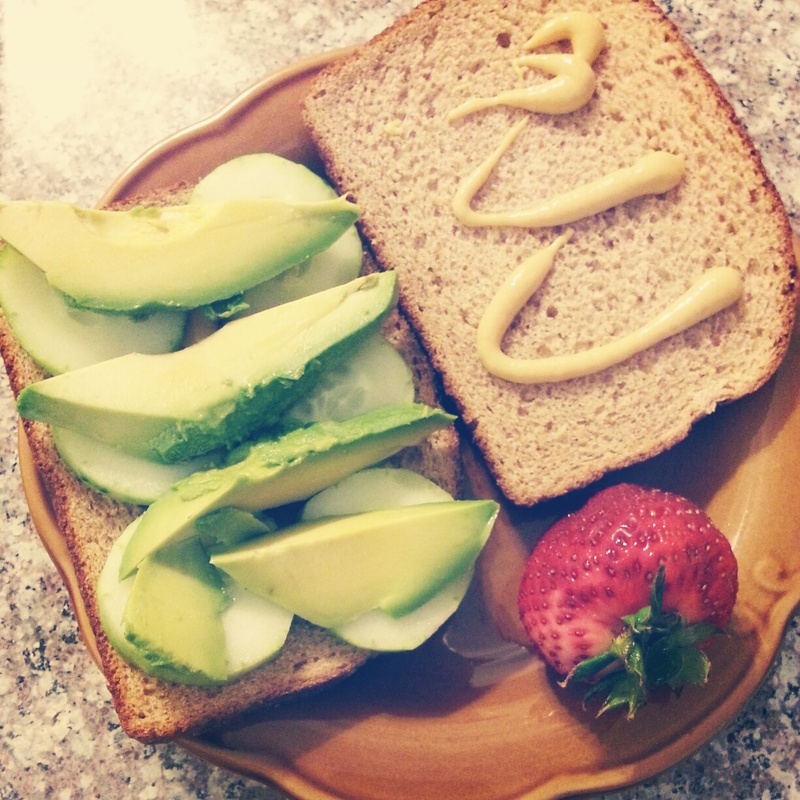 Paired with cucumbers and some honey mustard, it makes a delicious sandwich. Can’t forget strawberries and some pita with hummus on the side. Yum. 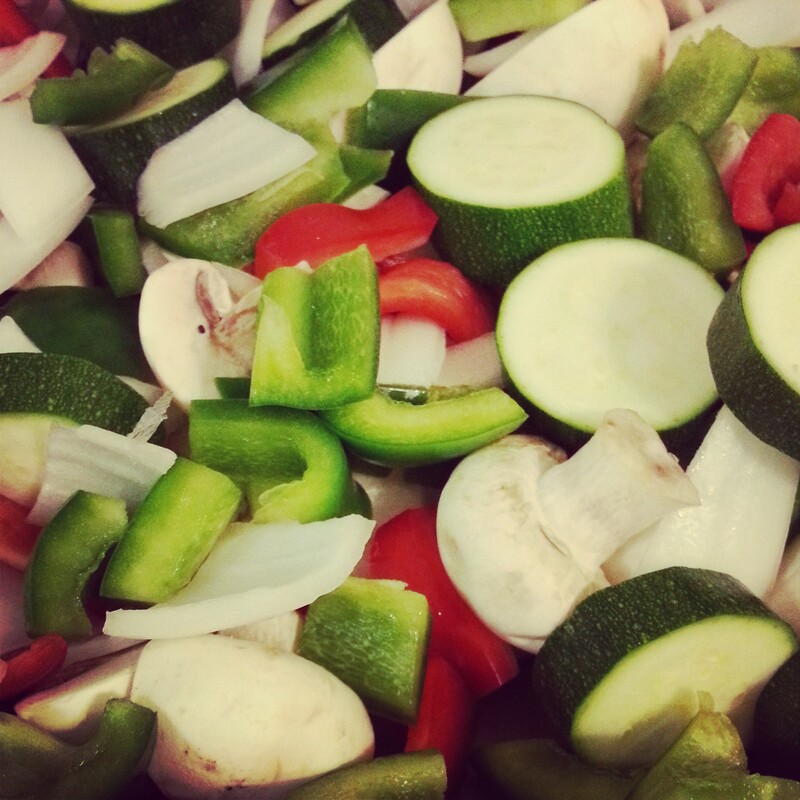 Cooking with vegetables is so much prettier than cooking with meat. This was for a roasted vegetable pasta I made one night that was really good (and healthy!). These are probably the best thing ever invented. From Trader Joe’s. 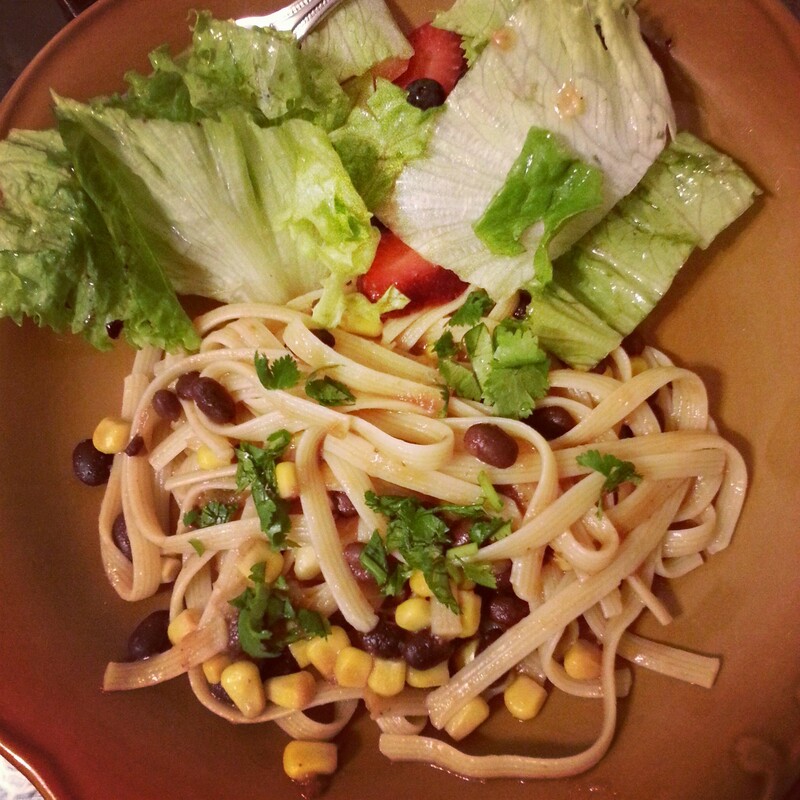 Southwest Fettuccine and salad. I threw this together very quickly one night. It has a unique flavor and doesn’t call for many ingredients. Plus, it’s vegetarian! Whitney put together this salad mixed with fruit and nuts. I hope this inspires you to try your hand at cooking because honestly, if I can do it, anyone can. You learn as you go, and you will become better at it. Plus, how great is it to have complete control over everying that goes into your meal, and how rewarding is it to sit down and actually eat it?! You save so much money by cooking rather than eating out, it’s healthier, and you get a lot of leftovers (so you don’t have to cook every night)! It’s really a win win win. The big challenge we are facing thus far without meat is to not just replace it with a lot of bread and cheese. It doesn’t help our health to just load up on fatty cheese and carbs, so we are trying to find ways around that. Since I didn’t mention it before, we are not giving up dairy products and eggs. A this point, that would be way too difficult for our lifestyle. Plus, I don’t want to replace those things with “fake”, processed, and manufactured cheeses, butter, etc. (especially when I bake). I’m thinking eating natural foods is the best way to go. But we are buying eggs from cage-free and grain fed chickens, as well as trying to drink almond milk when we can. Well, that was a whole lot, wasn’t it? If you’d like any of the recipes for these dishes, let me know. Until next time…! I did vegetarian for a few years, Ian even longer. It gets easier and more fun as you play in the kitchen. I like to relax as cook as well, it’s just so nice! 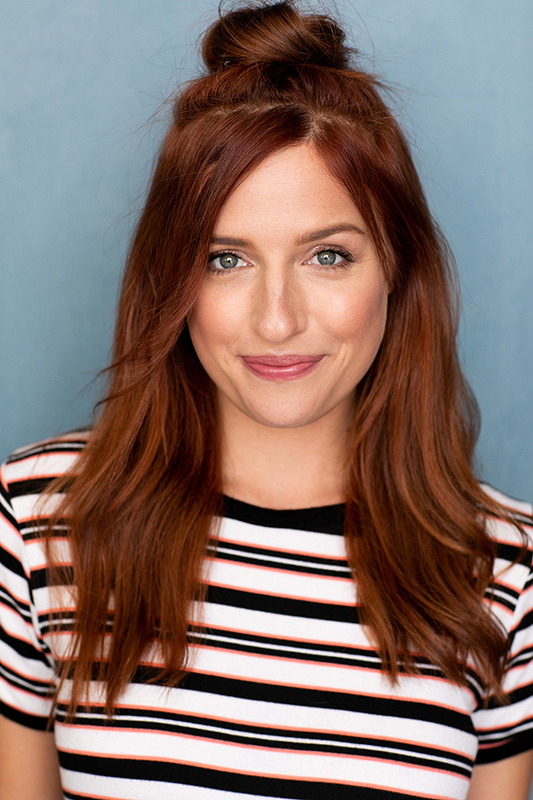 Try Oh She Glows for some great recipes. 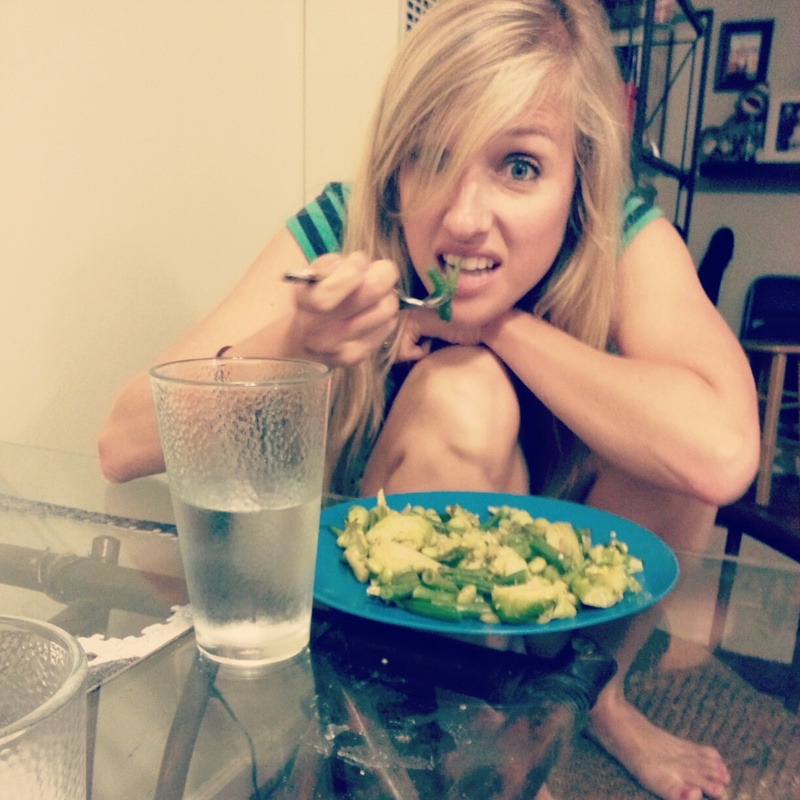 Oh, and I CANNOT stop eating avocados either. 🙂 happy cooking! I’m sorry I never responded to this! I didn’t know you were a vegetarian and for so long! I’m sure I’ll go back to eating meat, but right now I’ll feel so hypocritical if I do. I don’t miss it much…just every now and then. Plus it’d just be easier haha. I’ll have to check out Oh She Glows, thanks!